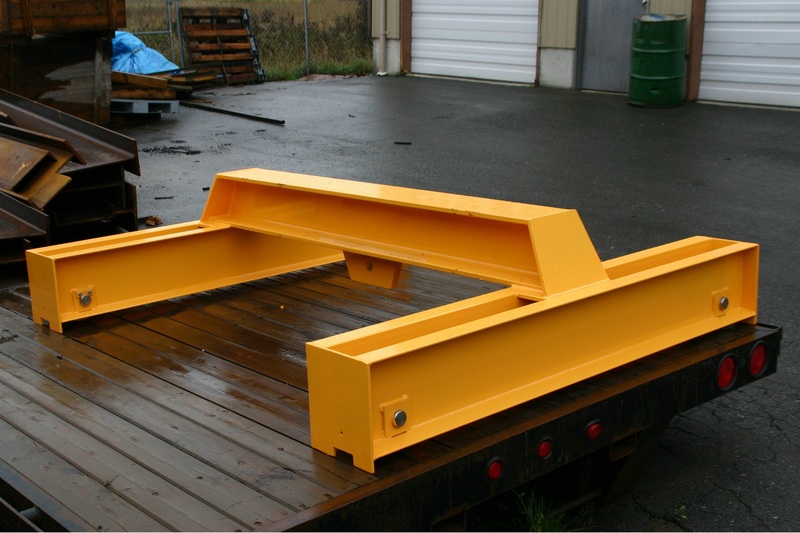 Mussell Crane proudly manufactures custom Mussell trolleys; designed, fabricated, finished, and assembled in Chilliwack, BC. Mussell Crane is also a distributor of other brand name trolleys, suppling to customers across Canada. 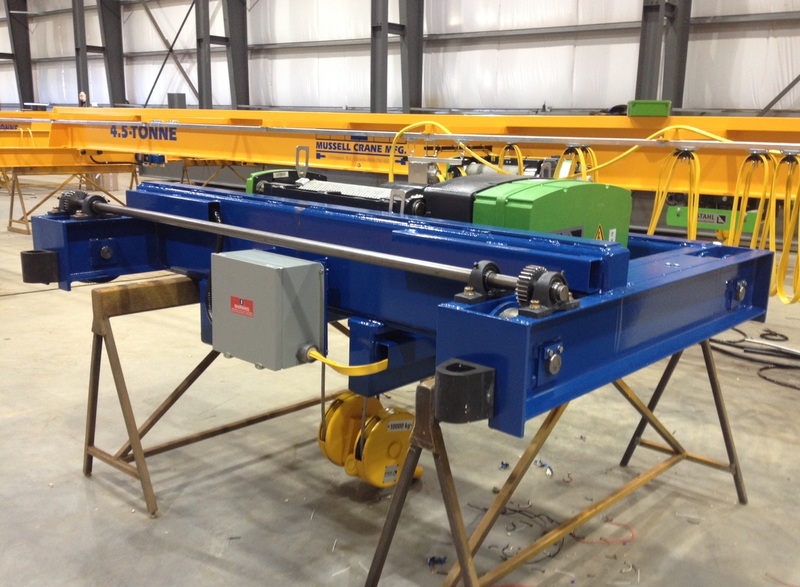 Mussell top-running trolleys are fabricated by CWB certified welders and come equipped with helical gear motors, Mussell double flange ductile iron wheels, in-house machined axles, rail sweeps, and high absorption dock bumpers. Single motor trolleys are also equipped with pillow block bearings & in-house machined drive shafts. An example of a Mussell custom top-running trolley pictured right. 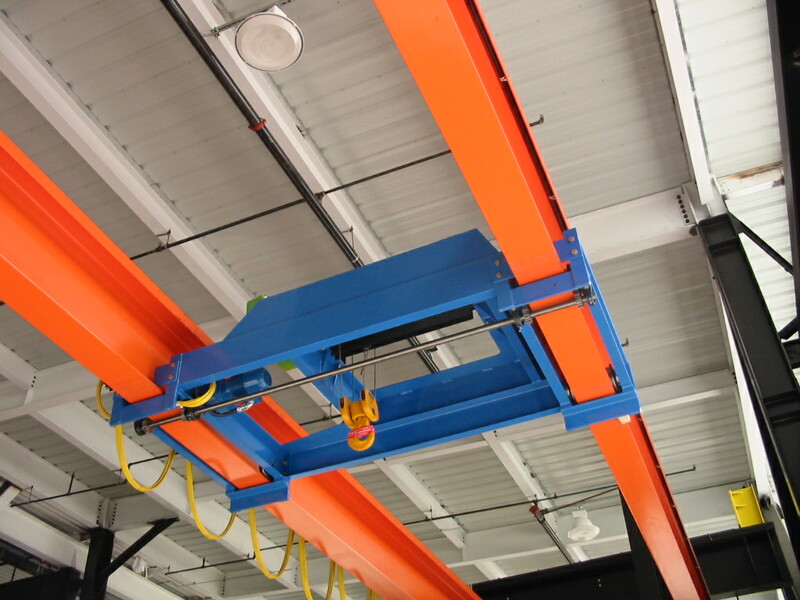 Mussell under-running trolleys are fabricated by CWB certified welders and come equipped with helical gear bridge motors, Mussell single flange ductile iron wheels, in-house machined pinions & axle modules, drop stops, and high absorption dock bumpers. Single motor trolleys are also equipped with pillow block bearings & in-house machined drive shafts. An example of a Mussell custom under-running trolley pictured right. Mussell manual geared trolleys are fabricated by CWB certified welders and come equipped with chain wheels, Mussell ductile iron wheels, in-house machined axles & drive shafts, pillow block bearings, high absorption dock bumpers, and rail sweeps (for top-running end trucks) or drop stops (for under-running end trucks). Gear reduction available upon request. An example of a Mussell custom manual hand chain driven trolley pictured right. 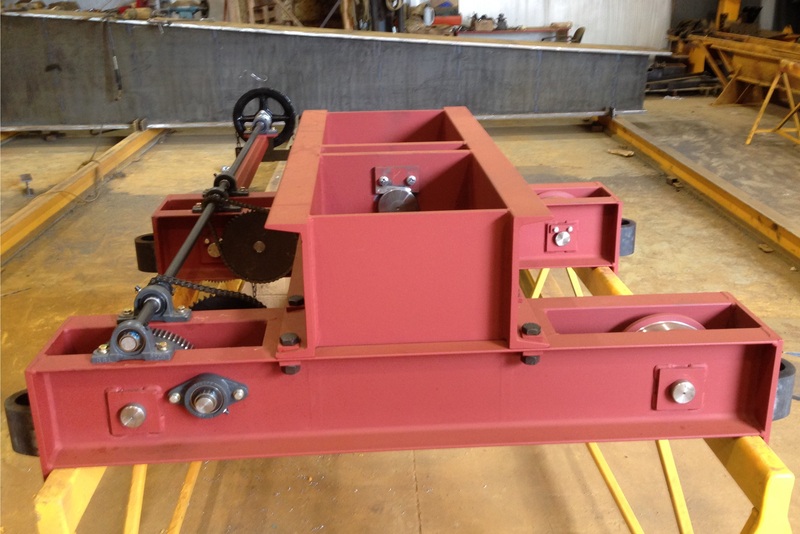 Mussell manual trolleys are fabricated by CWB certified welders and come equipped with Mussell ductile iron wheels, in-house machined axles or axle modules, high absorption dock bumpers, and rail sweeps (for top-running end trucks) or drop stops (for under-running end trucks). An example of a Mussell custom manual trolley pictured right.